Do you have news, reviews or comments for '2012'? Geordie Shore star Ricci Guarnaccio has swapped reality TV for the big screen, as he stars in the trailer for the Australian horror film Boar. Players from the 2012 Nittany Lion football team are making a documentary based on their season. Disney release their big holiday animation Ralph Breaks The Internet over the American Thanksgiving weekend and along with Creed II also making its debut and strong holdovers it makes for a record weekly take with the top 10 grossing over $200 million. This means that the new Ralph film is running $15 million ahead of its 2012 predecessor over the same period and should end up grossing far more in the long run. 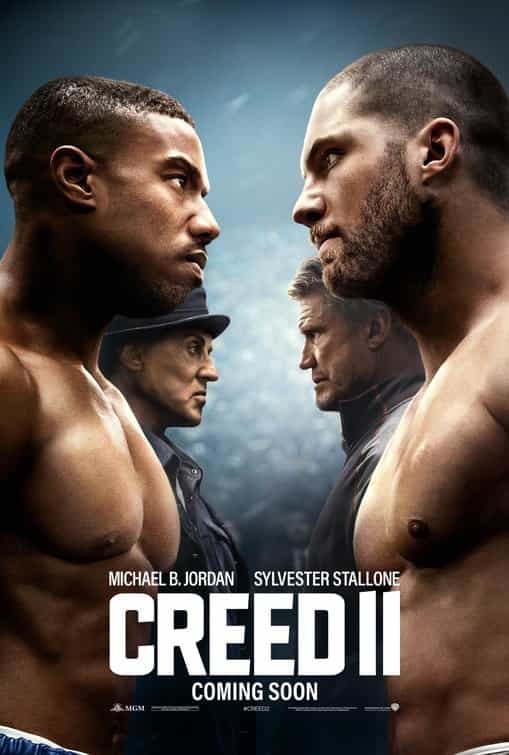 The follow up to Creed from 2015 and spiritual follow up to Rocky IV from 1986 the Micheal B. Jordan starring movie opens at number 2 with a $35 million opening 3 days and a $55 million 5 day Thanksgiving. This is far higher than the original movies opening by $14 million. The Grinch drops to number 3 this week after 3 weeks of release with a $30 million weekend gross, the film now has a total US gross of $180.5 million. After opening big last weekend the new Fantastic Beasts film runs into trouble this week and falls hard to number 4 with a weekend gross of just $29.6 million which brings the films 10 gross to a relatively poor $117 million. One film which has done better than expected and this week sits at number 5 is the Queen bio-pic which this week takes $13 million for a $152 million total US gross. One film that has not done too well on its debut weekend is the new Robin Hood movie starring Taron Egerton which limps onto the box office chart at number 7 with a poor $9.1 million gross. This week marks a bit of a mile stone in film global grosses, Despicable Me 3 goes over $1 billion, the first of the series to do so, this means now the top 30 top global grossing movies have all grossed over $1 Billion. The first movie to do so was Titanic back in 1998 and was the only film to do so for a long time, that film had another bite of the cherry in 2012 and its gross is now over $2 billion. The next film to do it was The Lord of The Rings: The Return of The King in 2003, since then we have had at least one film a year do the fate. The oldest film to go over $1 Billion is Jurassic Park from 1993, but again that had another go in 2011 which pushed it over the mark, Star Wars Episode I: The Phantom Menace similarly did the same. To date only 3 film have gone to $2 Billion, Avatar (the top grossing movie of all time), Titanic and Star Wars: The Force Awakens. The next milestone will be the top 50 all over a billion, which at the current rate will be some time in 2020/21, and then of course we look forward to the next Star Wars film going over the $2 Billion mark!. We've looked at the films to be released in 2017 and found it a tough year to narrow down to 10 films, hence there are many potentially excellent films missed off this list. After much debate and arguing, and some falling out and fist fighting, here is our list of films the 25thFrame staff are hoping will be the best of the bunch in 2017. Its 35 years later, 35 years where a sequel has been promised many time, but here we are, the trailer released only a few weeks ago was a tantalising sample of what is to come. No Ridley Scott this time but director Denis Villeneuve looks like he can deliver the good, and with Harrison Ford back and Ryan Gosling starring we could be in for a treat. Rogue One: A Star Wars Story delivered but didn't wow but the follow up to 2015's Star Wars Episode VII: The Force Awakens should deliver in spades and its possibly our most anticipated film of the year, and we have to wait until December! Rian Johnson has directed this instalment which is no bad thing, and as with all Star Wars films the ensemble cast all return, with the recent passing of Carrie Fisher it will be a sad moment if they complete the story arc of Princess Leah, but one which is necessary. 20 years after Trainspotting the guys are back for another dose of hard hitting, drug taking antics that will have us transfixed again. Danny Boyle returns to direct with original stars Ewan McGregor, Jonny Lee Miller, Robert Carlyle and Ewen Bremner all returning. Scarlett Johansson controversially stars in this live action version of the acclaimed manga animation, but judging from the trailer they have hit the right note. Rupert Sanders directs what promises to be one hell of a ride in the special effects heavy take that potentially no one will understand. The third in the excellent prequel films which tells the story of how earth became The Planet of The Apes. Special effects and motion capture are now at a point where we can truly believe that these apes have personalities and intelligence. Just from the trailer alone you know you want to see this and Baby Groot will be the highlight of the cinema year, and the film actually looks really good. James Gunn returns to direct Chris Pratt, Zoe Saldana, Vin Diesel and Bradley Cooper in this Marvel franchise film. Sequel to Prometheus and prequel to Alien, directed by Ridley Scott, not too much riding on this then. Prometheus was Alien enough to be part of the series but individual enough to be a film in its own right, looking at the fist trailer for Alien Covenant this could bridge the gap really well, we hope so. The original film delivered far more than the source material dictated, and it was actually a good film, worryingly this time Sam Taylor-Johnson is not returning to direct. James Foley is directing this instalment but Dakota Johnson and Jamie Dornan are returning so the chemistry should still be there in this much darker tale. A reboot of the 1999 franchise which spawned 3 movies, but got worse with each film, this time Tom Cruise stars and the first trailer looks like we could have a winner on our hands. Our guilty pleasure, the first film was one of the highlights of 2012 and although not nearly as good part 2 was still a lot of fun, time will tell if the idea is getting a little thin now. After 3 weeks of Batman V Superman Dawn of justice at the top of the video charts sequel movie The Huntsman Winters War takes over on its debut week of release. Released on 8th April 2016 the sequel to Snow White and The Huntsman from 2012 landed on the chart at the top, but it didn't last much after that! A 3 week run saw it disappear quickly from the box office top 10, although it did hang around cinemas for another 6 weeks after that. The films total gross was £5.2 million , 10 million below that of its predecessor. Batman V Superman falls from the top into 3rd place this week but is still selling in good number. Also new on the home video charts this week is Eye in The Sky number 2 and Criminal at number 7. This week sees the release of Disney's massive hit The Jungle Book which should swing into the top of the home video charts. Repeating the record setting achievement of it's predecessor on this weekend in 2012 Hotel Transylvania 2 becomes the top debut for a September weekend. The original Hotel Transylvania grossed just over $42 million while the new film has this weekend grossed $47.5 million. HT2 knocks last weeks top film down to number 3 after just one week, Maze Runner The Scorch Trials this week takes $14 million for a 10 day total of $51.6 million. Highest grossing film on the US box office this week is Mission:Impossible Rogue Nation which after 9 weeks has taken $193.5 million.